To a large mixing bowl, add the steak, oil, butter, salt, pepper, oregano, parsley, dried thyme, and rosemary leaves. Using a spatula, stir gently until everything is evenly combined and coated. Separate and spread out 4 12x12 sheets of aluminum foil. 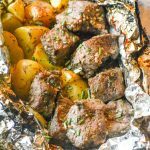 Divide the steak and potato mixture evenly out onto the center of each foil sheet. Wrap the foil up tightly around the contents of the packets, seal them well. Open the packets, let them cook an extra two minutes, and garnish with the fresh thyme leaves, serving immediately.